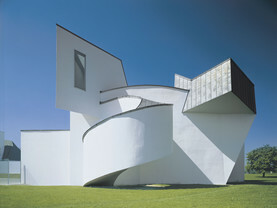 The Vitra Campus in Weil am Rhein near Basel is a unique ensemble of contemporary architecture. Fans of design and architecture from around the world are invited to take an architectural tour and discover the buildings designed by some of the most renowned architects, to visit an exhibition at the Vitra Design Museum, to come to the Lounge Chair Atelier and see just how much craftsmanship goes into making the design classic and to find inspirational ideas for their home at the VitraHaus, Vitra’s flagship store. 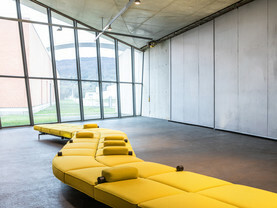 The Vitra Campus brings together the commercial and cultural aspects of the Swiss furniture manufacturer Vitra, which was founded by Willi Fehlbaum as a shop-fitting business in 1934. Production was relocated from Birsfelden (Switzerland) to Weil am Rhein (Germany) in 1950. After a major fire destroyed most of the productions areas in 1981, the second generation of the owner-operated company took the opportunity to rebuild them in collaboration with famous architects. After the fire in 1981, the British high tech architect Nicholas Grimshaw developed a master plan, a corporate identity that also took into account future expansions by Vitra. Six months later, production started up again in a building faced with lacquered aluminium. This was Grimshaw’s first building on the continent and a module set to serve as a model for future structures on the Campus. Another building of this type was built in 1986. In order to keep the inside spaces as free as possible, service areas such as stairs and toilets were located in external cube-shaped units. Together with his wife Coosje van Bruggen, Claes Oldenburg is considered an important figure in American Pop Art and is best known for his large sculptures. One of these is to be found on the Vitra Campus. It consists of a hammer, screwdriver and pliers – three important tools used in chair making – that have been greatly enlarged and fused together to create a gate. This present, given to Willi Fehlbaum by his children on the occasion of his 70th birthday, was the very first object to be put on the space in front of the production facility. Today, it stands between Tadao Andos Architecture of Silence and the sculptural Vitra Design Museum. The Californian architect Frank Gehry first became known for his furniture made of corrugated cardboard and later for his deconstructive buildings. The sculptural museum, with its towering structure and ramps is an eye-catcher, and the gatehouse and the production facility behind it have both been designed in the same style. 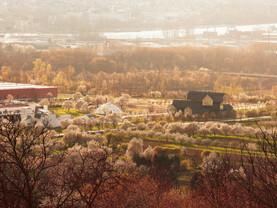 A large expanse of lawn creates the stage for Gehry’s first building in Europe. The museum’s interior is equally extraordinary, featuring rooms that interpenetrate one another and remarkable lighting. 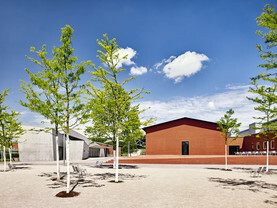 The Vitra Design Museum Gallery was built in 2003 as an annex to the front gate. The gallery is used for smaller exhibitions and experimental projects held parallel to the larger temporary exhibitions in the main building. In 1989 when the building was completed, Gehry was awarded the Pritzker Prize. After the fire in 1981, Vitra founded its very own company fire brigade. The building to house the fire brigade was designed by Iraqi architect Zaha Hadid and completed in 1993. Hadid’s very first building, the Fire Station building quickly became iconic and was the work launched her career. 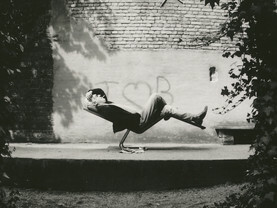 The expressive forms convey both activity and dynamism. The striking colour concept and the unusual spatial experience, which results from the lack of right angels and straight walls, are further extraordinary features. Eleven years after completing the Fire Station, Hadid was awarded the Pritzker Prize. A meditation path leads to the cubic Conference Pavilion. In order to perfectly integrate his first building constructed outside of Japan into the cherry blossom orchard, the later Pritzker Prize winner Tadao Ando used a low-level courtyard to ensure that the hidden lower floor was provided with natural light. By limiting the colours, doing without decorations and having the windows face out onto a natural landscape, Tadao Ando created an atmosphere highly conducive to concentration. The visible basic module is based on the Tatami mat with human proportions of 90 x 180 cm. With his modern buildings that are subtly integrated into the environment, the Portuguese Pritzker Prize winner Álvaro Siza is considered an architect of critical regionalism. His building in Weil exudes an air of calm and, with its brick facing, makes reference to the old production facility that burned down in 1981. The brick wall, which is slightly set back to allow an unobstructed view of the Fire Station, is framed and accentuated by the high, arched rain cover. Depending on the weather, the arched segment lowers automatically guaranteeing a dry passage between the production facilities. Beginning in the 1940s and on the basis of his geodesic domes, American architect Richard Buckminster Fuller established himself as a leading representative of biomorphic architecture, alongside Frei Otto and Santiago Calatrava. He patented his construction principle of spherical domes consisting of the triangular structure in 1954. The dome-shaped tent construction Dome was created in 1975 together with Thomas C. Howard at Charter Industries, and served as a showroom in Detroit (USA). 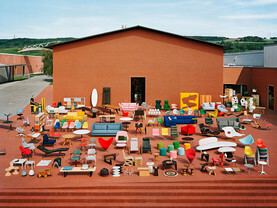 It was purchased at an auction in 2000 and installed on the Vitra Campus. It is based on the geodesic dome principle, which Richard Buckminster Fuller patented in 1954. Due to the triangular structure, only a minimal amount of materials are needed to achieve great stability and span. The industrially prefabricated and removable buildings by the French design engineer Jean Prouvé are considered pioneering. The Petrol Station was designed as a series for Mobiloil Socony-Vacuum in 1953 together with his brother Henry. Six stations were built in total. Since purchasing it in 2003 in Haute-Loire (France), it has been restored and installed in Weil. Typical features are the optimal use of materials for the form and the signal colours of the structure (white: frame; red: panels; green: base/cover). 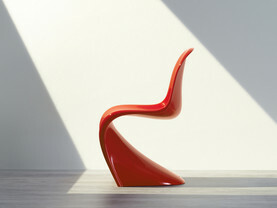 Vitra has had the worldwide rights to manufacture Prouvé’s furniture designs since 2001. British designed Jasper Morrison had already created some pieces of furniture together with Vitra before he was commissioned to make a bus stop as an entrance to the Vitra Campus in Weil in 2006. He created unique and elegant constructions featuring simple forms and made of polished steel. There are solar cells hidden in the roof for night-time lighting and glass back walls provide views both of the wine-making village of Ötlingen and the Vitra Design Museum. Naturally, the bus stops are fitted with Wire Chairs designed by Charles and Ray Eames and made by Vitra. 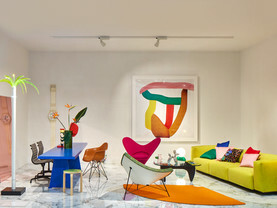 The VitraHaus is Vitra’s flagship store. 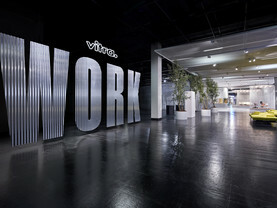 It is the home of the Vitra Home Collection and also serves as a gateway for visitors to the Vitra Campus. Herzog & de Meuron were inspired by the archetypical gabled house design used for private homes. They extended the form and then stacked a series of such houses on top of one another. The resulting work features clearly laid-out, homey spaces as well as dramatic deformations and views thanks to the way in which the houses interpenetrate one another. The architecture of the VitraHaus thus holds a variety of surprises in store for visitors, who can, thanks to the furniture arrangements in various styles, experience the great Vitra classics and the latest contemporary designs. The twelve nested houses of the iconic building house a shop, the Lounge Chair Atelier and the VitraHaus Café. This production facility was designed by the Japanese architects SANAA. 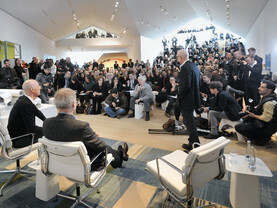 It has been a part of the Vitra Campus since 2010, except for the façade, which was completed in 2012. The building is rounded in shape, but not quite circular, and is composed of two concrete shells that are connected to one another. The oval form optimises logistical processes by allowing trucks sufficient room for circulating in. The special feature of the production facility is its façade, which functions like a curtain to conceal the building’s dimensions. The development of this façade was highly innovative not only in terms of design, but also in terms of technology. With “Diogene”, Renzo Piano and his architecture office Renzo Piano Building Workshop have developed a living unit which unites all elementary functions of temporary living under one roof in a modest space of six square metres. 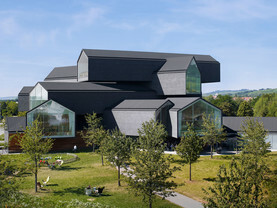 As the modern interpretation of an archaic cabin, “Diogene” is Vitra&apos;s largest product, but also the smallest building of the architectural ensemble in Weil am Rhein. The building is named after the ancient Greek philosopher Diogenes of Sinope ("Diogene di Sinope" in Italian) who is said to have lived in a barrel because he considered worldly luxuries to be superfluous. Although “Diogene’s” façade matches that of a simple house, it is in reality a highly complex technical building with consumption, production and disposal satisfying the highest demands of sustainability and energy efficiency. The 30.7-metre-high Vitra Slide Tower by the German artist Carsten Höller is a viewing tower, slide and art installation all in one. It consists of three diagonal steel columns that meet at the top, with a revolving clock mounted at their point of intersection measuring six metres in diameter. Access to the tower construction is provided by a switchback staircase with intermediate landings positioned between the slanted columns. A viewing platform at a height of 17 metres offers new perspectives of the Vitra Campus and the surrounding landscape. The platform is the starting point for the 38-metre-long corkscrew tube slide. The 500-metre-long Álvaro Siza Promenade is a walkway flanked by hornbeam hedges that passes along the west side of Siza’s factory building and connects the VitraHaus with the Fire Station by Zaha Hadid. It is conceived as a path with various stations: its sequential ‘episodes’ allow wide-ranging views of architecture and nature. These include an S-shaped common area framed by hedges, the Vitra Slide Tower by Carsten Höller and an archaic-looking double chamber with interpenetrating spaces defined by brick and granite walls. The bell is situated on the meadow in front of the VitraHaus, one of the two starting points of the Rehberger-Weg, which links the Vitra Campus with Fondation Beyeler in Riehen. It is one of the 24 waymarkers designed for the Rehberger-Weg by the German artist Tobias Rehberger. Cast by a professional bell maker, the brass bell is mounted on a pole where it can be rung by hand. The other starting point of the Rehberger-Weg, located on the grounds of Fondation Beyeler, is marked by an identical bell. The Vitra Schaudepot provides the Vitra Design Museum with a venue for presenting key objects from its extensive collection to the public, complemented by a new deli and a shop. The new structure combines the simple appearance of an industrial building or warehouse with the complex requirements of a walk-in museum repository. To the outside the building presents itself as a monolithic volume constructed from hand-broken bricks, characterized by a completely windowless façade and a simple gable roof. The bricks were split on site and give the building a lively texture. The interior of the building offers ideal conservational conditions for the preservation of the valuable pieces in the collection. The Vitra Schaudepot is fronted by a raised, public forecourt that ties the building into the architectural ensemble on the Vitra Campus. The new building contrasts appealingly with the dynamic contours of the opposite Fire Station by Zaha Hadid while corresponding to the factory buildings by Álvaro Siza, which were also executed in brick. Blockhaus is a small structure by the German artist Thomas Schütte. Serving as a shelter with a watering place, it adheres to different principles than the buildings on the campus designed by architects, thereby presenting an ambiguous antipode. Set on a slightly irregular hexagonal footprint, the cabin is constructed from untreated Nordic pine which will take on a grey tone as it ages. The visually prominent roof is covered in titanium zinc shingles, whose gleaming metal creates a stark contrast to the archaic log structure. An opening on one side invites visitors to enter. Two simple benches are mounted along the interior walls. The central area contains a trough fountain made of fired clay, offering fresh water to cool off or enjoy a drink. Blockhaus is an object derived from a 1:10-scale model exhibited by Thomas Schütte in 2016 at the Galerie Konrad Fischer in Düsseldorf. Two new projects by Ronan und Erwan Bouroullec invite visitors to prolong their visit to the Vitra Campus in Weil am Rhein: Ruisseau is a narrow channel carved in a marble base, filled with running water. Ring is a circular platform made of galvanised steel, which appears to float above the ground. Encircling a cherry tree, it serves as collective bench.